to determine who is in a phot that is marked Grinnan, Paris KY.
place of Hugh Henry (1765-1835) and Rachel Anderson Henry (1765-1839). Any assistance that you could provide would be most appreciated. 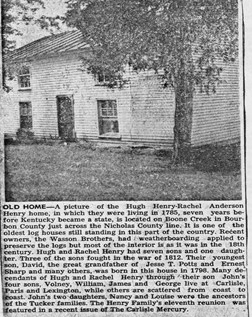 Transcription of the Newspaper article above: OLD HOME - a picture of the Hugh Henry-Rachel Anderson Henry home, in which they were living in 1785(? ), seven years before Kentucky became a sate, to homestead on Boone Creek in Bourbon County, just across the Nicholas County line. It is one of the oldest log houses still standing in this part of the country. Recent owners, the Wasson Brothers, had weatherboarding applied to preserve the logs but most of the interior is as it was in the 18th century. Hugh and Rachel Henry had seven sons and nine daughters. Three of the sons fought in the War of 1812. Their youngest son, David, the great grandfather of Jesse T. Potts and Ernest Sharp and many others, was born in this house in 1790. Many descendants of Hugh and Rachel Henry through their son John's four sons, Valney, William, James and George live at Carlisle, Paris and Lexington, while others are scattered from coast to coast. John's two daughters, Nancy and Louisa, were the ancestors of Tucker families. The Henry Familys eleventh reunion was featured in a recent issue of the Carlisle Mercuty. Any help with my missing link would be greatly appreciated. Major Brick Wall: Anything you can post or share would be most welcomed! Thank you. Emily Wilson was born in Bourbon County, Kentucky, December 14, 1814, and departed this life in Hagerstown, Indiana, October 26, 1884, near 70 years of age. She removed with her parents to Indiana in 1826, and settled on the farm where Jacob Mason's family now lives. Her first marriage was to Tobias Bickle, who died, leaving his wife and eight children. In after years she was united to John Castor, her now bereft husband; united with the Christian Church at Flat Rock, Henry County, in her youthful days. A number of years ago, she moved to this place and placed her membership in the Christian Church, and remained in fellowship with the church until her death, when she was removed to the Church triumphant to die no more. Her funeral sermon was preached by Rev. Wm. C. Bowen at the church to a large congregation. Text of the sermon was from First Thess., 4th chapter and 13th verse to end of chapter. She leaves behind an aged husband and her surviving children, all of whom are married, and many friends to mourn her loss. She was a good neighbor and kind companion and mother. I have several members of my family that lived & died in Bourbon Co. Jacob Workman, Bn 1770 or 72 , married to Elizabeth Wyckoff , moved to Bourbon Co. circa 1812 . yet I can find no indication of him or wife on any records. I did find on another website that they were buried in the Paris cem. there. Please help. I am researching the Abel Johnson Sr and Jr families whom I believe were in Bourbon Co, KY until about 1840 when they left for Missouri . One of them married Mary Hibler in 1818. I am aware of 3 sons born to this couple: Abel Jr (I have a date of 1817), Andrew W born 26 Dec 1823 and William H 4 January 1826. They supposedly had several other children but at the moment, I do not have any names. The parents of both Abel and Mary are unknown. I am interested in finding any information about the Humphrey Hill School. Three children of Captain John Whitledge (deceased October 1788) were sent to the Humphrey Hill School and one of them, Susannah, later married John Humphrey. I don’t’ think the school was public. I do believe that it was started under the auspices of a church. After John’s death, the children were placed in the care of Francis Callis, who later married the childrens’ mother, Alcey. Trying to locate information on my GGgrandfather, Joseph Peyton who married Jemima Nelson Jan. 1805 in Bourbon County, Kentucky. Found him on Census and tax roles there 1810, 1820. I need help locating the parents of Moses Lemuel Fowler, b 7 Mar 1827, d. 11 Nov 1895, m. Georgeanna, 19 Jan 1856. Listed in the 1850 census as living in Mason County, Kentucky. They are both buried in the Paris Cemetery, Bourbon, County, Kentucky. He is listed in the 1880 census as living in Bourbon County, Kentucky. I am looking for Joseph Allen born 1803 Kentucky who moved to Gallia Ohio where he married Elvira Shelton. Family stories say he was part Indian. Joseph Allen could read and write. He kept his children's names in a "gentleman's book. ", He wrote on the inside cover "Joseph Allen his book" I thought this seemed a strange way to write but have since read about a book that Abraham Lincoln had inscribed the same way. I was hopeful that there were pictures of some of the Coffman family. I lost my grandmother when I was 9 and am trying to find all I can about the Coffman's of Bourbon Co., Kentucky. Thanks. I am searching for the parents of Thomas Jefferson Rodgers, born 1806 on Rodgers Branch(his words in a letter to a local paper here in Illinois). He married Mary Hickman, children, Marthaa and Orville I believe,came to DeWitt Co. Ill, Mary died, he married America Walters, more children, in about 1865 he moved to Bourbon Co Kansas, Ft. Scott Area where he died in 1896, buried there in Evergreen cemetery. IN 1880, he stated his parents were born in Ireland and he born in Ky. He left a son Wallace Rodgers, but had a son John and a daughter too. who may have been dead by 1896. He was related to Elizabeth Rodgers Wallace Jamison 1762-1827 who died in Bourbon Co. Ky. I suspect William Hamilton Rodgers was his grandfather, can anybody help??? I am looking for information on my Brown family in Kentucky in the early 1800's. Robert Brown b 1800 in Pa, d 1853 in Streator, IL, married Mary Ann Reed in 1831 in Ky. Mary Ann was b 1808 in Ky, d 1899 in Streator IL. Robert Brown's father was William Brown b abt 1760, d 1841 in Marshall County, IL. William was a Revolutionary War Veteran who fought as a pvt in the Va Militia and also in the War of 1812. I'm looking for any information you may have on Jonathan Scott. He was born in Virginia. His father, Simon Scott was kidnapped from Scotland, worked as a cabin boy on a ship, then sold as an indentured servant when the ship cam to the Carolinas. Simon married a Mary "Polly" Watkins Horn (or maybe Harn, Harnes). We believe that Jonathan had at least two brothers: William and Daniel. Jonathan Scott was born in 1778. He married Catherine (or Katherine) Borders who was born in Rowan County, North Carolina. Jonathan lived in Bourbon County, Kentucky from about 1800 through 1840. In about 1816 he was ordained a deacon in the church of God by a Peter Hon. He moved to Monroe County, Indiana in 1840 and purchased a tract of land. He died 8 miles west of Bloomington, Monroe Co., Indiana on 29 Nov 1845. I'm hoping you can give me additional information on Jonathan and/or other family members. Also, I'm interested in information on the Church of God and anyone I could contact regarding their membership records. We do have a copy of Jonathan's obituary and his will. Jonathan is my g-g-g-g grandfather. Looking for the wife of George Grant who was the father of my gggrandfather, George Hall Grant, born in Fauquier County, Virginia in 1805, and his father was born in Va. in 1775. Married to Eliza A. Witherspoon on 14 Dec 1832 in Pope Co., IL. I cannot find a birth date for him and I don’t know who his parents were. He had a daughter named Martha H. Hickman who married Robert L. Davis on 15 Feb 1854 in Bourbon Co., Paris, KY. Birthplace and parents of WILLIAME BURKE HICKMAN; WILLIAM was the son-in-law of GEORGE WITHERSPOON who died in Marion, KY in 1844. WILLIAM witnessed GEORGE WITHERSPOON's will, dated 1840. WWILLIAM HICKMAN was married to ELIZA ANN WITHERSPOON. any information would be most helpful. Thanks. I am looking for any information on Abner Doan 1775-1821. He married Jane Andrews 10-10-1810 in Bourbon Co.. Abner died in Daviess Co., Indiana. His father was Hezekiah Doan(e) and mother Sarah Bland. Any information of the Doan's or Andrew's is appreciated. Thank you. My great3 grandfather and grandmother were Charles Campbell and Rachel Campbell. I am trying to find out the maiden name of Rachel, and Charles's family, but so far to no avail. Charles was born in 1796 and Rachel was born in 1800. Charles and Rachel married on October 31, 1818 in Fayette County, Kentucky. By the 1820 census, they were living in Bourbon County. They had 5 children: William, born 1826; Greenbury Williamson, born 1830; Louisa E., born 1838; Caroline, born 1840; and, my great great grandfather, Charles H., born 1842. They continued to live in Bourbon Co., KY, until the sometime after 1850. The 1860 census shows Rachel as a widow, living with her son Charles H, 18, a farmer in Dewitt Co., IL. Rachel is then living with her daughter Caroline Storts's family in Clinton, Dewitt Co., IL in 1870, and in Platt Co, IL in 1880. According to familysearch.org, Rachel died sometime after 1880. However, I haven't been able to get her exact death date, or her husband Charles's exact death date. Any help that you could give me or let me know where the best place to go from here would be greatly appreciated. Thanks for your time. My husband's great-grandfather was from Bourbon county, KY . His name was Abel Johnson and he married Mary "Polly" Hibler 1 Jan 1818 in Bourbon County, Ky. The family had several children, some of whom were most likely born in Bourbon co. The relocated to Paris, Monroe county, MO prior to 1841 where John Thomas Johnson was born. Other siblings we have located on census reports were William H., Lucinda and Joseph W.
It is amazing that out of possibly 11 children born to this couple we have been unable to locate any of today's generation. I have reached a brick wall confirming the parents of my grandfather Quince Ward Moore (1892-1947). His father is listed as James Moore and mother as Fannie Chandler? on his death certificate. At this period of time (late 1800's) in Bourbon County there are many with the name James Moore although family oral history says he died at the Bourbon County Old Folks Home & Poor Farm and was buried at the Ruddles' Mills Methodist Church cemetery. This cemetery is overgrown and my search for a gravestone unsuccessful. Since Quince's youngest siblings were twins named Sophie and Lizzie and born in 1896 he was still alive. I have been unsuccessful in finding an obituary or death certificate. 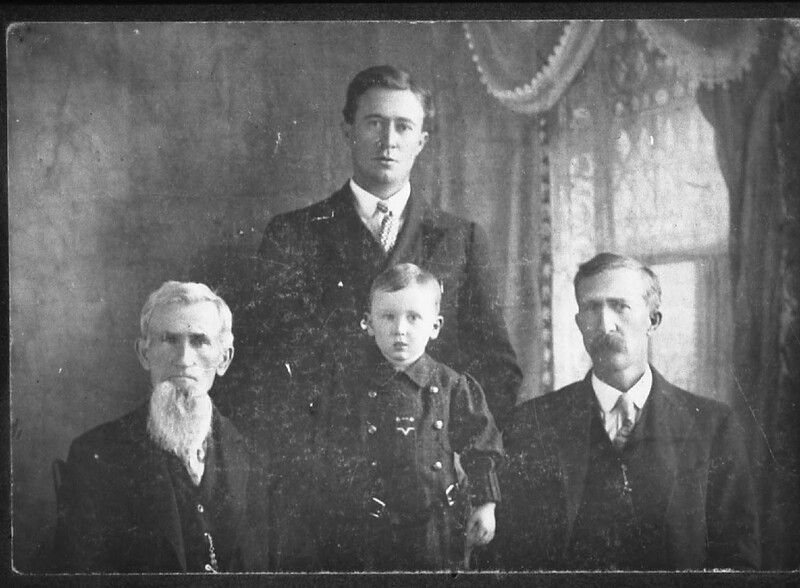 Using a Bible record of John M. Stuart found at Duncan Tavern in their genealogy library, I believe my great, grandfather is James C. Moore the oldest son of Noah Spears Moore Sallie Ewalt Moore. My great uncle's name was Noah Andrew Moore and since he was the oldest son he may have been named for his grandfather, but I have no confirmation. If this is the case, I would then need the names of Noah S. Moore's parents who I believe were Andrew Moore and Sarah Morin Moore. He was born May 4, 1851, Bourbon co., Kentucky and his name was John William Bayles. I cannot figure out who his parents are, although I kind of narrowed it down to one of the sons or grandsons of Nathan and Adeline Bayles. John William Bayles' last child was a Adeline Bayles. he was sent to live with a aunt. He is found on the 1860 Bourbon co., Kentucky census living with Marianne (Kitty) Hildreth Fretwell Cogar. Mary-Eveline Hildreth married John Bayles in 1844. He died before 1857. But yet, on the 1860 census John William Bayles is not living with her, but with his aunt Kitty. There is a possibility that John William Bayles was fathered by one of the Bayles sons, but born out of wedlock.....either Nathan who died in 1851 or John who died before 1857. Researching John McMahan and his wife Sarah Sally Cook. They are parents of my Grandfather Percy C. McMahan born Oct 14, 1891 or 1892, in Bourbon County, Ky. There were many siblings. If any one has any information please e-mail me. I hope to be able to solve my Dykes and Browning's family dilemma's with the help of your viewers. My Great-grandfather William T. Dykes b. ca March 1833, marr. Sarah J. Hendricks KY. It's a possibility the John and Patsey ( ? ) Dykes of Bourbon Co. are William T.'s parents but this has not be proven. Millersburg, Bourbon Co. KY would possibly be William T. birthplace. When William T. marr. Sarah J. they raised all nine of their children in Millersburg, therefore spending almost all of their lives in Millersburg, KY.
One of their dau. 's Georgia A. Dykes b. Feb 1875, married ca 1889; to Charles C. Browning, b. 01 Oct 1868. They are found in Millersburg, Bourbon Co. KY also, until moving to Paris, KY and residing there until death. Chas. C. Browning d. 15 Apr 1944 Paris Bourbon Co KY; Georgia A. Browning d. 15 Jun 1961, they are both buried at the Paris Cemetery. I am hoping someone in the area will be so kind to look up their Obituaries which I will gladly reimburse them for their time and troubles. I am researching John Smith who married Mary Ann Ellis, daughter of James Ellis, on 4 July 1795 in Bourbon County. Would appreciate any information about this John Smith, his family, etc. John Nesbit/Nesbitt b 1810 Bourbon County or Winchester, Clark County, KY. There are conflicting reports. He married Sophia Grahm Layne in Floyd County 1845. He was in the 1850 Floyd co census and after that Sophia was with the children. One article I read said he was an attorney. Did not find that either. Found no death date of place of death. His father was said to have been a John Nesbitt and mother Mary McClure but I can not prove this. If he was married more than once I do not know. Hoping that some one will have information for me. I have two brick walls in Bourbon County. One is the location of Stoner, which I assume was along Stoner Creek, but where? The other is Samuel Isley Rodgers who was in Stoner when daughter, Susannah, was born in August 1817. A Samuel Rodgers is on the 1820 census of Stoner. No white persons are indicated on his line, but he is not identified as a "free colored person" as are others on this census. A Samiel or Samul Rodgers is on the 1810 census of Stoner. but having no further information on Samuel and his wife, Susannah ROSS Rodgers, I am unable to make a connection. Any assistance is appreciated. I am searching for either the parents of or any siblings of Mary Polly Adams. She was born in Kentucky around 1782. She married Jasper Dazey on November 21, 1805 in Bourbon County, Kentucky. Any help would be appreciated. My gt gt grandfather was James M. Ellington, who md Eliza Jane See (dau of George & Margaret Thornton See) on Oct 16, 1838. I think that they were md in Bourbon Co., KY. James is on the 1850 Census in Nicholas Co., KY Census. James came to Indiana in 1859. I am trying to find his parents. There is a David Ellington in the Census who could be his brother. Any help will be appreciated. My brick wall is the parents of Jacob Baker of Nicholas Co who died in 1814, wife Barbara (possibly nee Sagasser). Believe he is a son or brother of Isaac Baker who settled in Bourbon Co and shows up with him (Jacob) on the 1797 and 1797 Bourbon Co Tax list. An Isaac Baker signed a $600 surety document at the estate settlement of Jacob Baker in 1814. Does anyone know any more of this Isaac Baker of Bourbon Co. There were two Isaac Bakers in Bourbon about the same time. One went to Sangemon Co ILL and had a son Jacob born 1790 who also lived in Nicholas Co. This Jacob is too young to be my ancestor though. I am trying to find out information concerning a Mr Taylor who married a Miss Poston (I believe her name was Sally), who had a daughter, Elizabeth, who married Anderson D. Garrard, the grandson of Gov. James Garrard. From that union came my gggrandmother, Lucinda Garrard, who married George W. Tarr. Any and all help appreciated. Looking for more information on Catherine Cowan and John Brown married 10 Nov. 1797 in Bourbon County, Kentucky. I know they had property later in Allen County, Kentucky and John later died in Jefferson County, Missouri. Does anyone know of their parents, siblings, if they were born in Bourbon County? remarried and had five more. Once in Miss, I have creditable data. But for James in KY and his father, Alexander, born 1774 in SC all I have are suppositions. I don't know James' mother, any siblings, marriage or death of parents. I know even less about Alexander. A will notes an Alexander as the son of Moses Hall which is what I have found on various web sites. Any clarity anyone can provide would be welcome. I've hit a brickwall looking for Thomas Wilcoxen, may have been married to Sarah Ann Prather early 1800's. Bourbon County. Children: Sarah; Nellie; Nancy; John Wesley; Lizzie; Benjamin A.; Mirgrated to Missouri before 1836. Looking for additional information on James Brown and Martha Summers, married 06 Jan 1794 in Bourbon Co. Looking for information on a John SCOTT and ? (born ~1780-1790? Died after 1848 BOURBON KY?) I find no will for him in Bourbon county. John had a sister Polly (born 1770-1780, died 1851 BOURBON KY), a brother Andrew (born 1790, married Paulina, died between 1851 and 1860 in HARRISON KY), a sister Elizabeth (born 1770-1780, died 1848 BOURBON KY), and a brother Jonathan (born ~1780-1790? Died 1847 BOURBON KY). I am the great-great daughter of Allan Bashford b. 1833 from Paris, KY, who was a founder of the Kentucky Derby. I am looking for antecedents to his father, Allen Bashford, born in 1802 or 1805 in Ohio. I thought there might be some descendants of Allen (Sr) other sons around: e.g. of James b. 1839 or Jacob, b. 1844 or Thomas Owen b. 1850 around who might have some information. Searching for information about Richard Biddle, Jr. and wife Anne "Nancy" Clark Biddle. A younger son of Richard Biddle, Sr from Cecil Co MD originally, Richard Jr. served in the Rev War, resided in Baltimore and inherited the majority of his fathers estate, married Ann Clark dau of Robert Clark of Harford County 10 Dec 1786. He removed to Bourbon Co after 1788 and was "...an active and prominent pioneer" until his death 25 April 1826. Father of Lydia Biddle Devore, my g-g-g-grandmother who died in Calloway County, MO ~1853.